Marine debris is recognized as a major threat to biodiversity and can be found ubiquitously even in remote regions, including deep-sea environments. Isla del Coco National Park is known as one of the best protected areas around the world, a preferred diving destination, and is also renowned for large aggregations of pelagic species that attract illegal commercial fisheries. Despite its pristine reputation, this study demonstrates that anthropogenic debris can affect this remote and well protected area. Images of marine debris were taken using the DeepSee submersible, mainly plastic litter from fishing gear were found between 200 and 350 m depth. A total of 40 items of debris were found in 5.48% of 365 dives, 60% of the items were plastics, and local boat and fishing activities provided most of litter. Our aim with this research is to raise awareness about the potential problem of solid wastes and fishing gear deposited in the deep environments of Isla del Coco National Park and to explore the potential implications for the ecological integrity of this protected area, including ghost fishing and the possible ingestion of pollutants. These results provide useful management information for the area, especially if one considers the constant pressure of illegal fishing and tourism at Isla del Coco National Park. Marine debris, which is defined as persistent, manufactured or processed solids that have been disposed of or abandoned in the marine and coastal environments (Coe and Rogers, 1997), is now recognized as a global problem and one of the major threats to biodiversity (Gall and Thompson, 2015; Browne et al., 2016). There is field evidence for impacts on marine species assemblages due to anthropogenic debris (Browne et al., 2016). Threats to the marine ecosystem arise due to (see revision in Browne et al., 2016): (i) entanglement or ghost-fishing, where animals can be caught and killed by lost fishing gear such as nets or traps (McFadyen et al., 2009); (ii) alteration or destruction of habitat modifying the original community structure (Katsanevakis et al., 2007; Widmer and Hennemann, 2010); (iii) ingestion of debris (Jacobsen et al., 2010; van Franeker et al., 2011), and (iv) rafting, which is a well-known mechanism for dispersal of species, but anthropogenic material can potentially transport alien species across the oceans (Barnes and Fraser, 2003; Barnes and Milner, 2005; Lewis et al., 2005; Molnar et al., 2008). Also, marine debris can be harmful to human health (Vethaak and Leslie, 2016), has the potential to increase the transport of contaminants (Mato et al., 2001), and it is aesthetically detrimental and hard to remove and control, having in general negative socioeconomic consequences (McIlgorm et al., 2011; Butterworth et al., 2012). Litter can now be found ubiquitously even in remote regions, as some studies have demonstrated (Bergmann and Klages, 2012; van Cauwenbergue et al., 2013; Woodall et al., 2014), and deep seas are not exempt from its presence (Schlining et al., 2013; Pham et al., 2014). Marine debris can now be found in remote places as the Artic deep waters, where Galgani and Lecornu (2004) found 0.2–0.9 pieces of plastic per linear kilometer at 2,500 m depth, and according to Bergmann and Klages (2012) the amount of litter deposited in the same area has been increasing; the same trend is expected to happen around the world. The deep sea is now recognized as a major sink for microplastic debris (van Cauwenbergue et al., 2013; Woodall et al., 2014). However, anthropogenic debris in deep-sea environments has been less studied since deep-sea surveys are logistically difficult and economically more expensive compared to those conducted in surface waters and along beaches (Ryan et al., 2009). Isla del Coco is an oceanic island located 500 km off the Pacific continental coast of Costa Rica and is the summit of a seamount on the Coco Submarine Volcanic Range, that extends from the Galápagos Islands to the southern part of Costa Rica (Lizano, 2012; Rojas and Alvarado, 2012). Isla del Coco National Park is known as one of the best protected areas around the world (Edgar et al., 2014), and is recognized for its high diversity, biomass and endemism, features that have made the island a preferred diving destination across the world (Cortés, 2012, 2016). Also, this protected area is renowned for large aggregations of pelagic species, especially sharks (Carcharhinidae and Sphyrnidae), billfish (Istiophoridae) and tuna (Scombridae) (Friedlander et al., 2012; López-Garro et al., 2016). The high abundances of these species attract commercial fishing vessels that enter the protected waters, and illegal fisheries represent one of the major threats of this World Heritage Site (López-Garro et al., 2016). Since 2006, the submersible DeepSee has been used to study deep waters down to 450 m at Isla del Coco (Cortés and Blum, 2008). During submersible dives images of marine debris, such as garbage and fishing gear, have been taken around the island. Estimates of baseline abundance and composition of litter are crucial to implement litter reduction policies (Page et al., 2004; Ryan et al., 2009). Here we present a percentage of immersions where marine debris was observed, and information about the places where it was found. However, our images were obtained from non-systematic samplings, since the submersible was used with touristic purposes. Despite that, these images represent a great opportunity to analyze the problem of solid wastes and fishing gear deposited in the deep waters of Isla del Coco National Park. With the aim to explore the potential implications for the ecological integrity of this protected area, future research should focus on improving our understanding of the faunal composition and the effects that marine debris may have on the local communities. Fishing gear was the most common type of litter found. These results provide useful management information for the area, especially if one considers the constant pressure of illegal fishing. Isla del Coco National Park is found in the Pacific Ocean (5°30′-5°34′ N and 87°01′-87°06′ W). This site covers 24 km2 of terrestrial area, and a protected marine area extending 22.22 km around the island (Cortés, 2008). The Isla del Coco National Park is part of the Isla del Coco Marine Conservation Area (ACMIC: Área de Conservación Marina Isla del Coco), that also protects around 9,640 km2 of marine ecosystems with seamounts (Área Marina de Manejo Montes Submarinos). Images of marine debris were captured from videos taken with the DeepSee submersible (Cortés and Blum, 2008) around Isla del Coco National Park (Figure 1) between 2006 and 2015. DeepSee is a three-person submersible with capability to dive to 450 m. When debris was observed the camera recorded the objects for small periods (less than a minute). Videos were recorded with an AVI format on mini-DV tapes by a high definition Sony HDX7 camera (frame size: 1920 × 1080 pixels) and then transcoded with a 4:2:2 low codec to a.mov format. Image grabs were made in the laboratory using iMovie and FinalCut software (Apple Inc.). Observations of debris were not made systematically because the DeepSee is used for tourism, and random recordings are focused mostly on large, conspicuous animals. Figure 1. Dive sites (50–450 m depth) at Isla del Coco National Park where the submersible DeepSee has acquired images of marine debris (found between 200 and 350 m depth). Marine debris was quantified from 365 dives at 17 different locations (Figure 1). Debris images were classified according to material composition and possible origins (boats/coastal origin, fishing debris or diving tourism). Associations of organisms with debris were noted and described, according to our video observations. The possible ecological threats that marine debris may represent were discussed according to the composition of litter and its interaction with the marine fauna. Marine debris was observed in 20 (5.48%) of the immersions (n = 365), a total of 40 images were captured from the videos (Table 1). Litter was observed in four diving sites: The Wall 0475 (in ten dives), Piedra 165 (four dives), Piedra Drop (four dives) and Kili (two dives) (Figure 1), between 200 and 350 m depth. 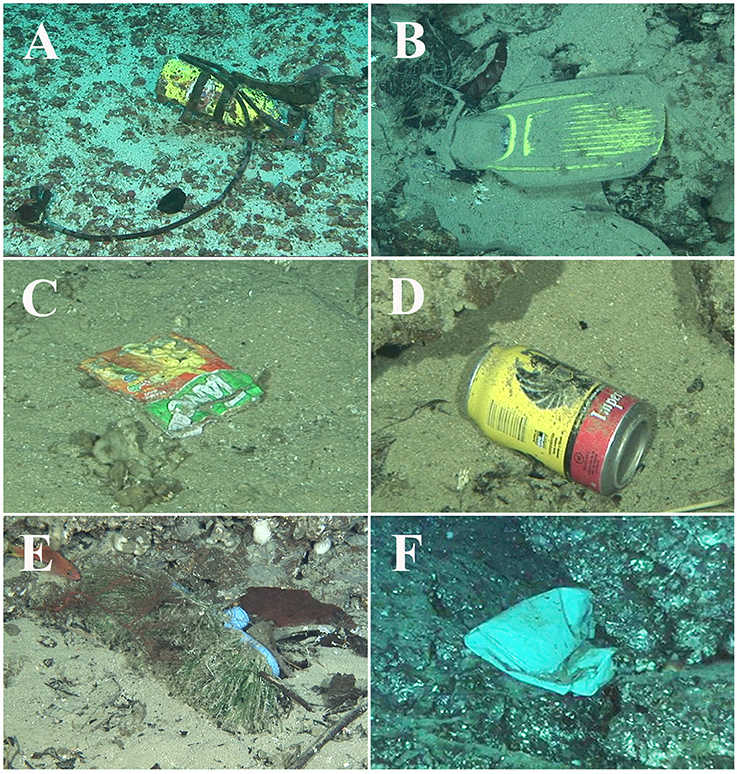 The most common items of litter deposited in the deep waters were: fishing gear (n = 15), beverage cans (n = 13), scuba gear (n = 3), and other debris (which includes plastic bags, clothes, brooms, chair remains, and product wrappings; n = 9). Debris was observed in contact with megafauna in 27.5% of the cases (Table 1). Table 1. Characterization of marine debris observed during DeepSee human-occupied vehicle immersions at Isla del Coco National Park (2006–2015). 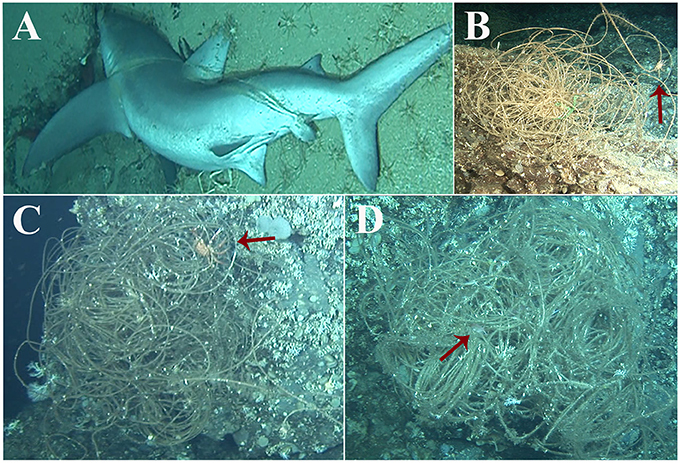 Fishing gear comprised lost lines (Figure 2), between 200 and 350 m. One line was attached to a recently deceased silky shark, Carcharhinus falciformis, of approximately 250 cm total length at 200 m depth (Figure 2A); this shark was not a case of ghost fishing, many sharks are target species of illegal fishing in the vicinity of the National Park. 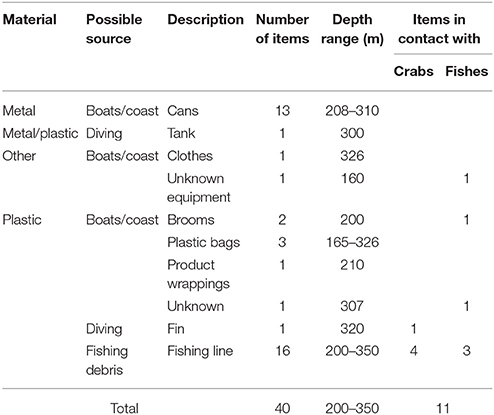 Almost half of the fishing debris was observed in contact with fishes or crabs (Table 1). Since some organisms grow in the lines, such as algae and corals, lost fishing lines may represent a suitable feeding place and refuge for some species. Crabs were observed feeding next to the lines (Figure 2B) or were entangled in the lines (Figure 2C). Fishes were observed feeding or looking for refuge between the bundled lines, like the Anthiinae (Serranidae) shown in Figure 2D. Scuba gear, which included tanks and fins, and other debris are shown in Figure 3. Figure 2. Abandoned, lost or discarded fishing gear deposited in deep environments of Isla del Coco National Park. (A) Silky shark (Carcharhinus falciformis) attached to a line at 200 m depth. (B) A crab presumably scraping food from the fishing line, 302 m depth. (C) A tangled crab (red arrow) in a fishing line, 320 m depth. (D) A serranid (Anthiinae; red arrow) looking for food or refuge inside a fishing line, 350 m depth. Figure 3. Scuba gear and other debris deposited in deep sediments of Isla del Coco National Park. (A) Scuba tank, 300 m depth. (B) Fin, 320 m depth. (C) Product wrapping, 210 m depth. (D) Beer can, 220 m depth. (E) Broom, 200 m depth. (F) Plastic bag, 240 m depth. Most of the litter observed was plastic debris (60%), mainly fishing gear (Table 1). Other small litter items made from plastic or containing large amounts of plastic included plastic bags, brooms, product wrappings and scuba gear. Cans represent the second most common item in terms of abundance. Overall, metal represented 35% of the litter composition, whereas 5% of the litter was made with materials other than plastic or metal, such as clothes and unidentified materials. Considering possible sources of debris, the majority likely came from boats or resulted from coastal activities. However, many debris items were in relatively good condition with little signs of degradation, suggesting that they had not traveled long distances and are the product of activities within or near the conservation area. Fishing activities contributed to 45% of the debris deposited at the bottom. The remaining 5% was from diving activities directly. The images presented here demonstrate that the deep-sea environments of Isla del Coco National Park are exposed to human waste, despite its remoteness and despite being considered one of the best protected areas in the world (Cortés, 2012). Some studies have shown the accumulation of debris items in the deep sea (Galgani et al., 1995, 1996; van Cauwenbergue et al., 2013; Woodall et al., 2014), and this is the situation at Isla del Coco National Park. However, the frequency in which litter was found in the present study (40 items in total, in 5.48% of the 365 dives) is much lower than that found in other studies; for example, at a similar depth (300 m) Schlining et al. (2013) found 22 items in just three visits to one of the areas with more debris accumulation in Monterey Canyon, California. The four sites from which we have debris images are deep and down-current from the island and the anchoring sites of the tourist vessels. The bottom around the island is relatively flat and sandy with a few rocks and seamounts. At a depth of around 180–200 m there is a steep drop to 2,500–3,000 m (Lizano, 2001; Cortés, 2016). We also observed organic detritus, leaves and sticks, from the island at all depths on the insular platform. As Schlining et al. (2013) pointed out, marine debris as a global problem is going to have lasting effects because the rate of debris input is not decreasing and debris accumulation is occurring in certain areas depending on hydrographic and geomorphological characteristics. A long-term systematic monitoring of debris at Isla del Coco National Park is necessary to better understand the distribution and density patterns of litter. Special attention should be given to submarine canyons, which have complex features that facilitate sediment transport and accumulation, and which can act as an effective conduit for the transport of debris into deep sea (Mordecai et al., 2011). Like other studies, most of the litter items found in Isla del Coco are made of plastic. This is a common situation given around 8 million tons of plastic enter the oceans every year (Jambeck et al., 2015). It has been calculated that between 60 and 80% of all marine debris is plastic (Derraik, 2002; Butterworth et al., 2012), which is similar to the percentage of plastic found in this study. Miyake et al. (2011) found accumulation of litter in deep-sea trenches and depressions, and most items were composed of plastic. Plastics are extremely durable synthetic polymers, and the associated throw-away culture has led to a plastic waste management problem and widespread accumulation of plastic debris (Thompson et al., 2009; Butterworth et al., 2012). Also, plastics are buoyant, they can be dispersed over long distances and when they settle in sediments they may persist for centuries (Goldberg, 1997). Plastics can be denser or lighter than seawater, those that are buoyant float when first entering the sea, so historically attention has focused on the accumulation on shorelines and at the sea surface (Ryan et al., 2009). However, because of fouling by organisms and adherence of particles, positively buoyant plastics can, over a timescale of weeks to months, become negatively buoyant and sink (Lobelle and Cunliffe, 2011). 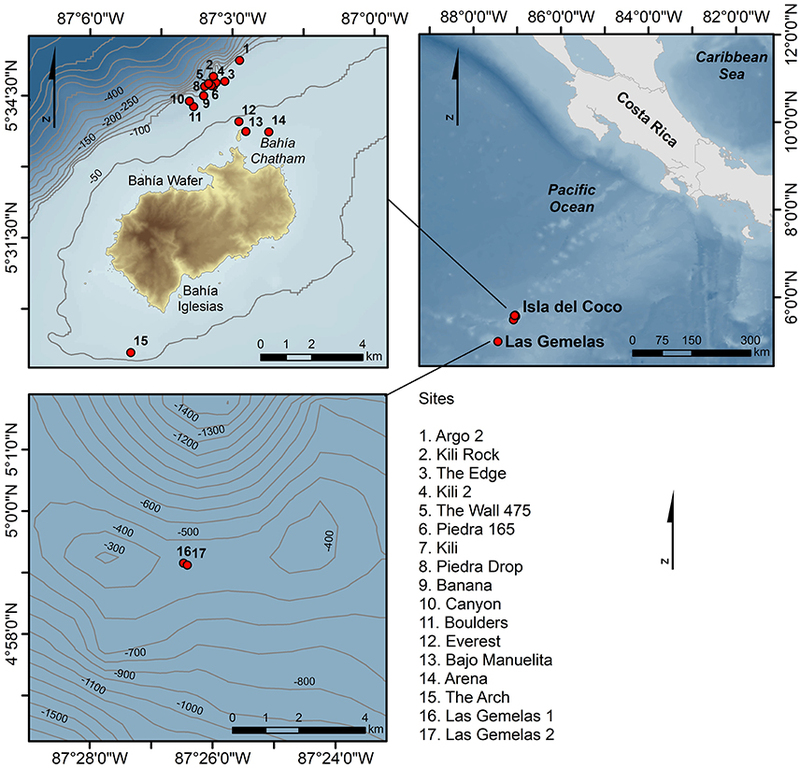 In the waters surrounding Isla del Coco, special attention should be paid to the seamounts since they are preferred fishing sites (López-Garro et al., 2016). Starr et al. (2012) observed lost fishing gear while comparing fish assemblages between Isla del Coco National Park and Las Gemelas Seamount, which is located 50 km southwest of Isla del Coco. Overall, they observed lost fishing lines on 33 occasions, but 30 of those were observed in Las Gemelas Seamount in just four dives. At Isla del Coco National Park, Starr et al. (2012) observed 3 lost fishing lines in two of the 12 dives made. The fishing activities produce large amounts of marine plastic debris, and ships in general are an important source of this pollutant (Horsman, 1982; Derraik, 2002). Globally, abandoned, lost and discarded fishing gear (known as ALDFG) compose less than 10% of total marine debris by volume (McFadyen et al., 2009; Pham et al., 2014). In the studied area, illegal fishing is considered one of the major threats against conservation efforts (López-Garro et al., 2016). During 2012 to 2014, surveillance patrols within the Isla del Coco National Park found 108 fishing lines and seized more than 500 km of fishing line (López-Garro et al., 2016). Just in 2007, 1516 illegal boats were observed in the waters of Isla del Coco and 600 km of fishing lines were seized (Castro et al., 2008). This is probably an underestimation of the real situation, since many fishermen are attracted by the high abundance of pelagic species, mainly tunas and sharks (Arias et al., 2014). The potential effects of ALDFG have been raising awareness over the last years, mainly due to the expansion of fishing efforts, and the use of synthetic and more durable and buoyant materials (Derraik, 2002; McFadyen et al., 2009). Synthetic fishing gear could eventually accumulate in marine ecosystems, having long-term effects on marine biota (Moore, 2008). van Cauwenbergue et al. (2013) suggested that the tracing of fishing effort and gear type would be an important step to elucidate hotspots of litter abundance on seamounts, ridges and banks, which points to the need of better surveillance and fishing records around Isla del Coco. Many marine species had been harmed or killed by plastic debris (Gall and Thompson, 2015). As some of our images show, crustaceans and fishes are probably looking for food near the lines, since marine debris may acquire encrusting organisms such as bacteria, algae, diatoms, and subsequently other organisms. The entanglement, mainly of crustaceans, is of interest for future research at Isla del Coco. Another source of concern is the possible ingestion of plastic litter by organisms. Ingestion of plastic can block the digestive tract, damage stomach lining and reduce feeding rates, resulting in starvation (Taylor et al., 2016). Also, some chemicals contained in the plastic can have detrimental effects even at very low quantities. For example, polychlorinated biphenyls (PCBs) can produce reproductive disorders, increase risk of diseases, alter hormone levels, and even cause death (Lee et al., 2001). In addition, plastics can fragment to microplastics (less than 5 mm), with potential physical and biochemical impacts on food webs (Andrady, 2011; Law and Thompson, 2014). Since studies have suggested that concentrations of microplastics found in deep-sea environments (and remote places) can be similar to those found in shallow sub-tidal sediments (Woodall et al., 2014), microplastics need to be assessed in future studies in Isla del Coco National Park. Marine debris can generate other effects that are more difficult to identify. For example, litter on soft-sediments could alter the gas exchange and local biogeochemistry (Goldberg, 1997). Mordecai et al. (2011) reported anoxic sediments underneath a plastic bag. Cans and other metal debris are also persistent and can change the original structure of the benthic community. A detailed analysis of the litter items at Isla del Coco National Park is needed to identify the organisms attached to the litter. This can provide information about possible invasive species, since long distance “rafting” litter could introduce non-native organisms. For example, 7% of litter at beaches in a Norway location was colonized with exotic invasive barnacles and bryozoans. Biological invasions pose an issue of concern in Isla del Coco since this site is known for a high level of endemism (Cortés, 2012), and the presence of litter can increase the risk of alien invasion. Since marine debris can travel long distances, is difficult to know from where it comes from. However, some of the cans and scuba gear are likely from tourism activity. Tourism is the major economic activity that generates entries to the Isla del Coco National Park conservation efforts. Adequate waste management and tourist awareness programs are necessary to avoid the accumulation of marine debris, allowing Isla del Coco National Park to remain as one of the best protected places of the world and an example of conservation. Since one of the more isolated and best protected places around the world is not exempt of debris, the images shown in this work have important implications for marine protected areas globally because they can serve to promote the reduction of disposable single-use products, adequate waste management, and raise awareness to avoid illegal fisheries especially in a marine area with high abundance of top predators such as Isla del Coco National Park. BN-E: conceptualization of paper, processed the images, and wrote the paper; JC: conceptualization of paper, organized the project to obtain the images, review in detail all drafts of the paper, procured all the funding. The images were obtained by a collaborative agreement with the Undersea Hunter Group that operates the DeepSee. Funding for computers, assistants and preparation of the manuscript were provided by the Universidad de Costa Rica, projects: 808-98-013, 808-A9-902, and 808-B0-654. We acknowledge the support provided by the Vicerrectoría de Investigación and the assistant of the CIMAR for video analysis, Universidad de Costa Rica. We thank the owners, captains and crews of the Undersea Hunter Group, Shmulik Blum and his pilots of the DeepSee submersible for the video recordings. This is a contribution of the Centro de Investigación en Ciencias del Mar y Limnología (CIMAR), Universidad de Costa Rica. Butterworth, A., Clegg, I., and Bass, C. (2012). Untangled – Marine Debris: A Global Picture of the Impact on Animal Welfare and of Animal-Focused Solutions. London: World Society for the Protection of Animals. Castro, C., Gonzáles, W., and Estrada, F. (2008). Informe Anual: Convenio Guardacostas-MINAE-MarViva Comisión tripartita. San José: Ministerio de Ambiente Energía y Telecomunicaciones (MINAET). Coe, J. M., and Rogers, D. (eds.). (1997). Marine Debris: Sources, Impacts and Solutions. New York, NY: Springer. Cortés, J. (2016). “Isla del Coco: coastal and marine ecosystems,” in Costa Rican Ecosystems, ed M. Kappelle (Chicago; London: University of Chicago Press), 162–191. Galgani, F., and Lecornu, F. (2004). Debris on the sea floor at ‘Hausgarten’: in the expedition ARKTIS XIX/3 on the research vessel POLARSTERN in 2003. Ber. Polar Meeresforsch. 488, 260–262. Lizano, O. G. (2001). Batimetría de la plataforma insular alrededor de la Isla del Coco, Costa Rica. Rev. Biol. Trop. 49 (Suppl. 2), 163–170. McFadyen, G., Huntington, T., and Cappell, R. (2009). “Abandoned, lost or otherwise discarded fishing gear,” in FAO Fisheries and Aquaculture Technical Paper 523. Rome: FAO. Miyake, H., Shibata, H., and Furushima, Y. (2011). “Deep-sea litter study using deep-sea observation tools,” in Interdisciplinary Studies on Environmental Chemistry-Marine Environmental Modeling and Analysis, eds K. Omori, X. Guo, N. Yoshie, N. Fujii, I. C. Handoh, A. Isobe, and S. Tanabe (Tokio: TERRAPUB), 261–269. Copyright © 2018 Naranjo-Elizondo and Cortés. This is an open-access article distributed under the terms of the Creative Commons Attribution License (CC BY). The use, distribution or reproduction in other forums is permitted, provided the original author(s) and the copyright owner are credited and that the original publication in this journal is cited, in accordance with accepted academic practice. No use, distribution or reproduction is permitted which does not comply with these terms.